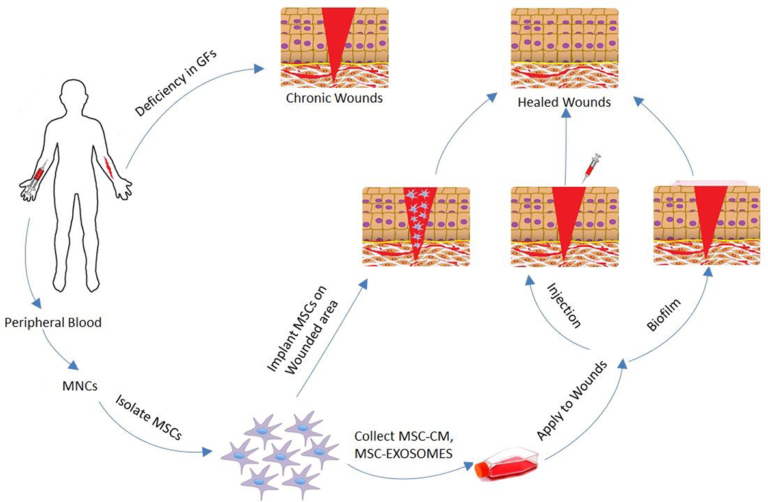 STEM CELLS TREATMENT FOR WOUND CARE: ESSENTIAL NATURAL BIOREACTORS! Stem cells treatment for wound-The human skin has a tremendous power to regrow and regenerate. It would be surprising for many people to understand that our skin regenerates every month, producing not less than 19 million cells per inch! Although, this colossal regenerative ability of skin cells is well known to scientist, it was rather a difficult task for them to grow the same number of skin cells in vitro. Contrary to this fact, recently a team of scientist has not only successfully grown fully functional skin tissue inside the Petri dish; but also transplanted the same,0 profitably onto a human being. This has certainly opened new avenues of treating burnt patients with the help of stem cells. These are superficial burns affecting only epidermis and the outermost layer of the skin. You will be able to distinguish the burnt skin, as a dry, reddish, or blanched patch; which can be very painful to touch and slough off after couple of days. As these wounds are never considered to be open wounds, they don’t as such require any dressings. Although, immediate cool compression either with cold water or ice packs can have effective soothing relief from burning sensation. Moreover, direct application of moisturizer with antimicrobial activity as well as sun block can prevent scarring and pain due to dehydration and stretching. Second degree burns also referred to as partial thickness burns can be categorized as superficial and deep partial thickness burns. The former category may affect the epidermis as well as some parts of the dermis. Apparently, these kinds of burns can be very painful due to exposure of nerve endings. Whereas the deep burns are more severe, affecting the deeper layer of the dermis. As a matter of fact, these burns take longer time to heal, and some even require skin grafting; if the scarring is too much! It is always advisable to avoid home remedies and cotton balls application in case of severe burns as opposed to first degree burns. However, immediate cold water therapy to subside further deterioration of skin should be implemented; other than which it would be beneficial to obtain prompt medical help. Third and fourth degree burns are extremely severe, causing major skin damage even to the deepest layer of the skin. Depending upon the cause as well as the type and the extent of burns; a patient may exhibit symptoms, such as waxy/white color, charring, dark brown color, raised and leathery texture, development of scar as well as blisters. Whatever may be the type of burns and the extent of its severity, alternative therapies such as stem cells therapy has been observed to be having a great potential in promoting prompt wound healing through the activation of cascade of reactions inside the body. Stem cells enriched with patient’s own platelet rich plasma, can play a role of promoter to create a suitable microenvironment, which can promote the synthesis and production of lost tissue specific cells. Thus in case of wound healing; stem cells therapy can promote active regeneration, repair and immediate wound closures.